Fresh vegetables, crunchy cashews, and marinated pork tenderloin. 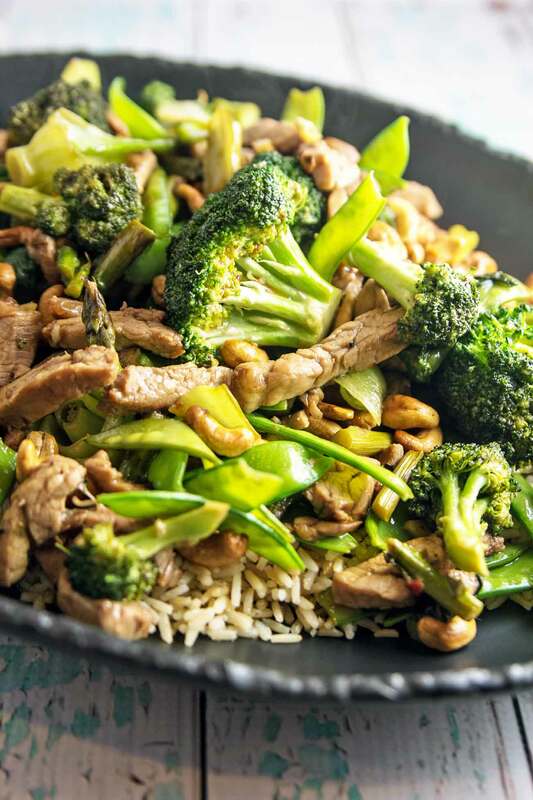 This pork stir fry is a delicious, vegetable-heavy dinner, on your table in under 30 minutes. It’s obvious that I don’t mind time-consuming endeavors in the kitchen. (Hi, have we met? I like to make things like this spiral vegetable tart or this layer cake with homemade blueberry cardamom curd.) Pre-baby, my ideal weekend consisted of hosting a large, multi-course dinner party, spending all day in the kitchen in preparation. Time consuming and difficult? Lots of detailed steps? Bring it. Except now I have a baby. I work full time in the lab and I go to the gym after work. I usually don’t get home until after 7, and my little guy is in bed by 9. That leaves me with 2 hours to cook dinner, eat dinner, get in my weekday playtime with Ryan, and go through our bedtime routine. Suddenly, quick and easy dinner options have become my jam. 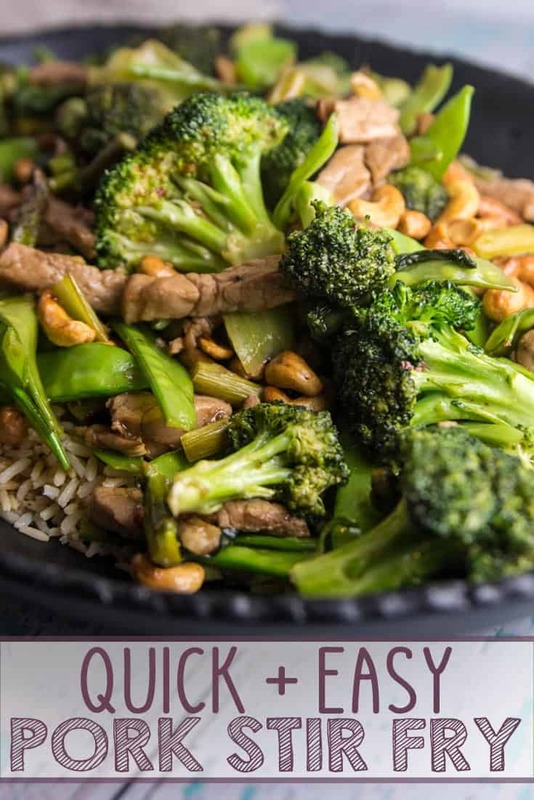 I’m pretty sure it doesn’t get any quicker and easier than stir fry, aside from ordering in. Except unlike ordering in, this homemade pork stir fry is much healthier, packed full of vegetables. It’s also super adaptable – throw in whatever vegetables you have on hand. 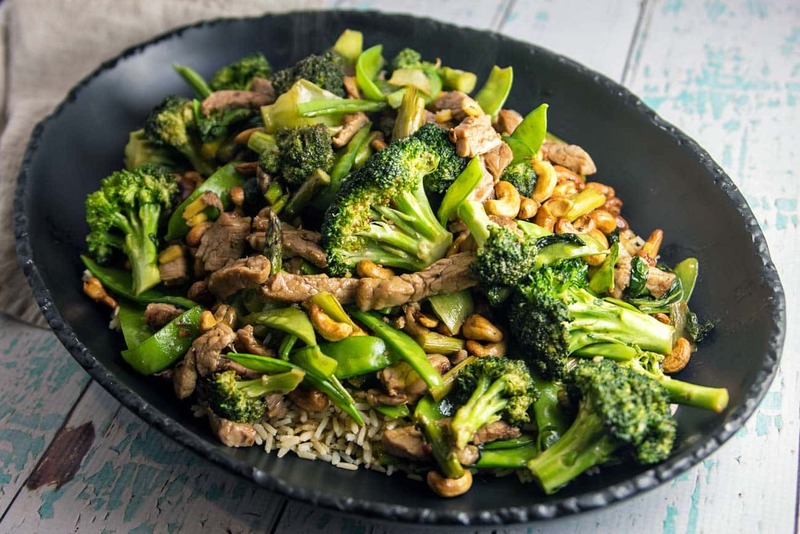 This particular variation uses bok choy, asparagus, snow peas, and broccoli. Why that combination? Because we received bok choy, asparagus, and snow peas from our CSA, and had broccoli in the fridge. Use onions or peppers or green beans. Shiitake mushrooms or bean sprouts? Delicious. This is truly an empty-the-fridge kind of meal. 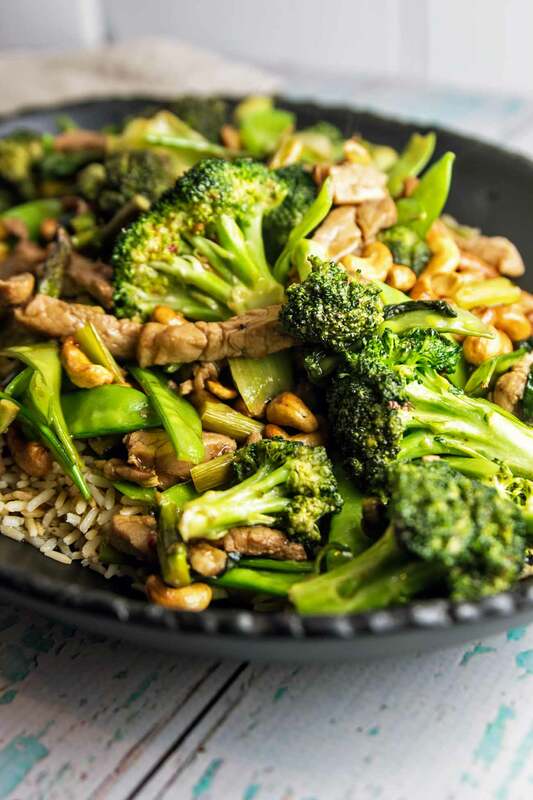 We’re going to pair all these delicious fresh vegetables with pork tenderloin and cashews for this pork stir fry. Pork tenderloin cooks quickly, which is exactly what we want for a stir fry — high heat, short amount of time. We’ll do a quick marinade (seriously quick – like 15 minutes quick) in some soy sauce and rice vinegar, with a little cornstarch to thicken up the sauce. While the pork is marinating, prep your veggies, which is as simple as chopping them into similar sized pieces. Heat some oil in your wok until it’s very hot, drop in a little garlic, ginger, and red pepper flakes, and then dump the meat and sauce right in. The pork will cook in under 5 minutes, and then it’s time to cook the veggies. Another 5 minutes, toss in some cashews (because that extra crunch is where it’s at!) and that’s it. Your pork stir fry is on the table. Use a wok – or the largest stainless steel pan you have available. The key to fast cooking is a large surface area, so the bigger the better! Don’t crowd the pan. You’ll notice I specify to cook the pork in one layer. If you can’t fit it all in one layer, do it in two batches. We need each piece of pork to make surface contact with the wok so it will cook thoroughly and quickly. Dry your vegetables. If you just rinsed your veggies, dry off any extra moisture with a paper towel. If you put them in damp, the vegetables will steam, rather than stir fry. We want crisp vegetables, not soggy! Cut everything to a similar size – this will help it all cook evenly. Big pieces take longer to cook than small (common sense). Because we’re cooking for such a short period of time, we want everything the same size. Cook your meat first — and only until it’s about 80% done. We’ll add it back into the pan with the vegetables at the end, and toss it again over high heat. This prevents the meat from overcooking. Keep it moving! The key to successful stir fry is that constant tumbling motion. Let things sit for too long and they burn. We’ll let the pork hang out for a minute to start to cook, but after that initial sear, keep stirring! 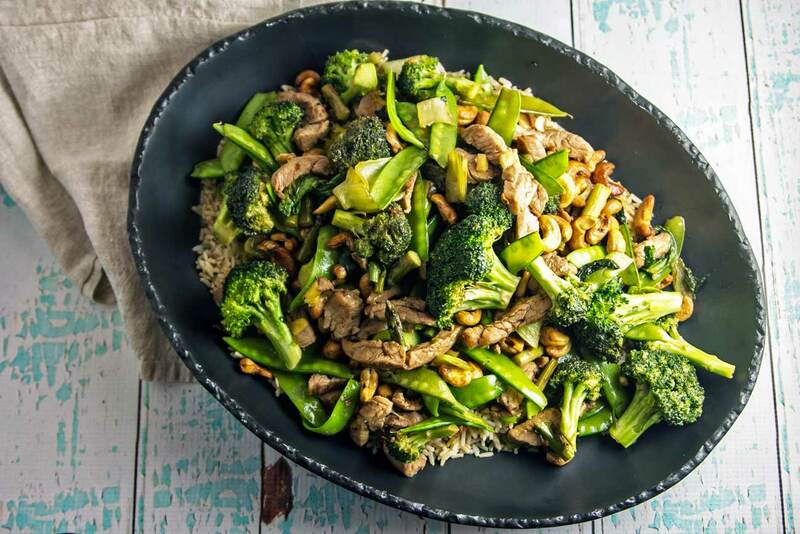 This quick and easy pork stir fry with cashews is on the table in under 30 minutes and packed full of vegetables. I usually serve it over brown rice or cauliflower rice. It’s a weeknight favorite in our house — and I’m sure it will be in your house soon, too. Slice the tenderloin crosswise into half-inch thick medallions. Cut each medallion into half-inch thick strips. In a medium bowl, whisk the soy sauce, rice vinegar, brown sugar, and cornstarch, until well combined. Add the pork, toss to coat, and marinate in the refrigerator for 15-30 minutes. Heat the canola oil in a wok over high heat. Add the ginger, garlic, and crushed red pepper and cook until fragrant, about 15 seconds. Add the pork in a single layer and cook for 1 minute, then toss and stir for 2-3 additional minutes, until the pork is almost, but not quite, cooked through. Remove the pork from the wok. 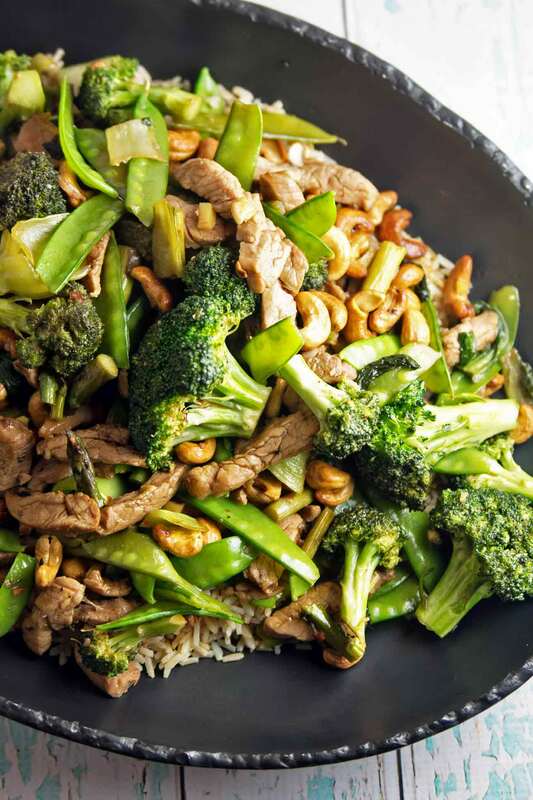 Add the bok choy, broccoli, asparagus, and snow peas to the wok, stir frying until crisp-tender, 4-5 minutes. Add the pork back into the wok, along with the cashews and toss to heat throughout. Remove from heat and toss with the sesame oil. Serve over rice. I can’t believe this is an under-30 minute meal–it looks so gourmet! I always need fast meals on weeknights, so this one is getting pinned for sure! The weeknight struggle is real. It is such a source of stress around here, so having a few easy go-to, extra speedy meals in my back pocket is a total lifesaver. Enjoy! This looks fantastic and you gave such great tips!! This is a perfect, healthy meal for a weeknight. 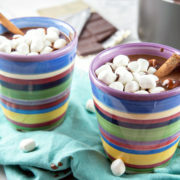 I will be making this soon. I’m loving the CSA adventures! Salsa verde and now this stir fry – nothing beats fresh produce! 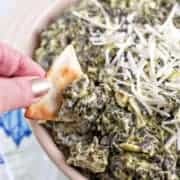 I’ve been trying to get into a faster dinner routine lately, so this recipe sounds perfect for us. Healthy and delicious and fast! Appears to be an exceptional dish! I love stir fry with pork. Thank you. 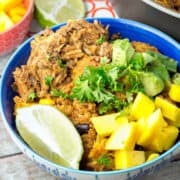 I love this idea using pork, thanks for sharing another great recipe! 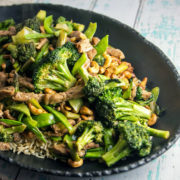 This stir fry looks delicious, love the addition of cashews. Thanks, Christina! Can’t wait until he’s old enough to ‘help’ me cook dinner (even if I know his help will make everything take twice as long!). This just shows that homemade can be just as good as ordering a takeaway, Much cheaper and healthier too! Love all the green vegetables in the dish! And i too love a stir fry – they’re so quick and adaptable, and like you say, so much healthier (and cheaper!) than ordering in! I’ve been doing a lot of stir fries lately and I am adding this one to the list! I am always on the lookout for tasty, fast meals. This totally fits the bill. I have everything on hand except the snow peas and cashews. Luckily it is shopping day! Guess what I’m making for supper. Cashews are just great in stir fries, so delicious, I just wish they weren’t quite so expensive. Agree completely – although it’s really the hazelnuts and pine nuts that are killing me right now. Pesto has become such an expensive endeavor! I found out the hard way that searing meat is no bueno in my little apartment in Boston. A quick 3 minute sear action of some chicken was enough to send my fire alarm blaring and my heart rate soaring. After that experience, sadly all meat is now cooked on low. Not the ideal situation but I don’t think my heart can take another fire alarm salute. So this beautiful stir fry will have to wait until I move to a more appropriate place (soon. . .I hope). But. . .it’s so tempting.